Claire Brownell, Cosima, and Eddie Korbich, a terrific Richard Wagner, coax Hermann Lebe to convert. 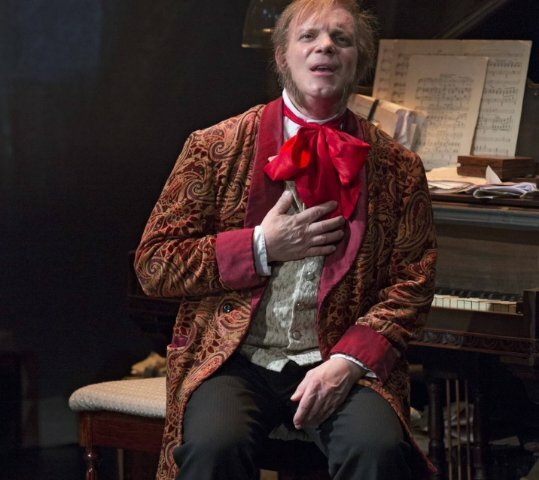 Eddie Korbich plays Wagner for all his worth, in alive and immortal scenes. Geoffrey Cantor is the man of the moment, as Hermann Lebe, a great, Jewish conductor of Wagner's music. Carlo Bosticco as King Ludwig, Wagner's big fan and generous supporter. 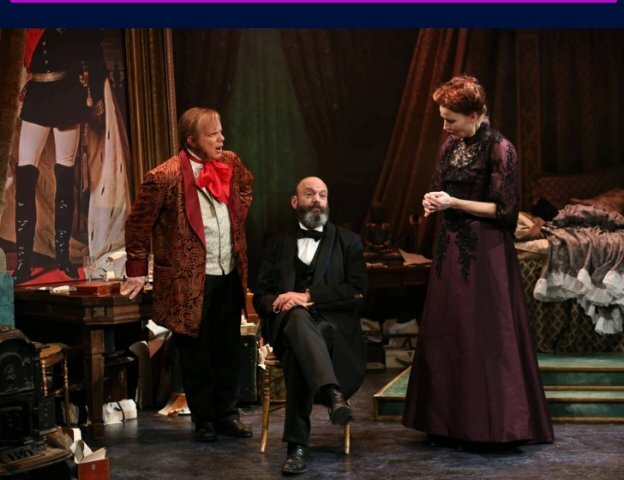 My Parsifal Conductor, Allan Leicht's hilarious and touching comedy on the late domestic life of Richard Wagner, which extends into immortality, is playing at the Marjorie S. Deane Little Theater in New York through November 3. At the center of the curtainless stage is a big double bed over which a heavenly canopy hangs. We are somewhere between heaven and earth as Cosima Liszt (Cher pere) von Bulow Wagner is taking her last gasps. She is ninety and married Richard Wagner 60 years ago, after the birth of their three children, Isolde, Eva and Siegfried. Wagner died after 13 years of marriage. Yet he lives on in this room, because he proclaimed himself immortal. So too does Frederich Nietszche, who peers out from under the bed and pops out from time to time. King Ludwig of Bavaria, a crucial financier of Wagner’s work, steps out from his portrait to insist that Wagner choose Hermann Lebe to conduct the premier of Parsifal. Three triangles criss-cross smoothly in and out. Wagner, King Ludwig and Cosima; Cosima, Nietszche and Wagner; and Cosima, Wagner and Lebe. 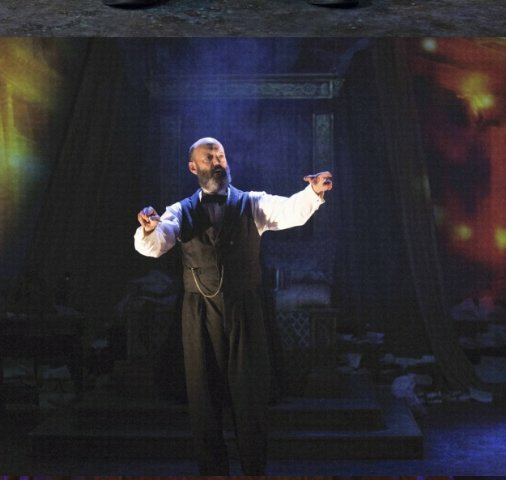 The play takes on the issue of anti-Semiticsm, which still swirls around the Wagners. Were they, or were they not anti-semites? For a hundred years, no one defended them. Recent research takes Wagner somewhat off the hook, but Cosima continues to be pilloried. Playwright Leicht has written a comedy probing this controversial subject. It is charming, wild and in the end mildly redemptive. Robert Kalfin directs delightfully. Casting is unusually apt for the central characters. Without much makeup and molding, each one resembles his real life model. Their characterizations are superb and engaging. It is hard not to like each of them. A balancing human hand has been brought to this fraught subject matter. Claire Brownell’s Cosima suggests why men liked her so much although they often feared her. Her challenging portrayal moves in time between the creation and premier of Parsifal in Germany at the new venue Bayreuth in 1882 and her life after Wagner died. Cosima continued to live in the thrall of her husband, holding his music and his ideas close as she prepares to join him in heaven almost a half century later. Brownell is a subtly and broadly expressive marvel. Her feelings for her husband are both reverential and urgent. She expresses them in active gesture and manic movement. Carrie Pringle (Jazmin Gorsiline) hovers in the background of the Wagner’s life and the Parsifal premier where she may sing one of the flower maidens. We get treated to her singing late in the play. She does not do for My Parsifal Conductor what Isteyn Davies did for Farinelli! Cosima is proud of her organizational abilities. In fact she inaugurated the Bayreuth Festival and kept it going to honor her husband. It is still one of the most desired venues in music. Papers are featured in the play. Important ones flutter down from heaven. Cosima keeps household accounts on her bedside table. Richard’s private correspondence is in a locked piano bench. Letters promising pink silk bloomers and other improprieties and indiscretions are consigned to fire as Cosima’s attempts to control her husband’s legacy. Much of what happens on stage is based on history. Cosima did cut off her long hair and bury it with Wagner. King Ludwig was gay, but not as mad as has been thought. He was committed to Wagner and insistent that a Jew, Hermann Lebe conduct the Parsifal premier. This sets off an hilarious challenge to the Wagners. Can they turn the man they must hire because money is attached to him into a Christian? Wagner comes up with the brilliant idea of baptizing him. The first step to realizing this idea is the presentation of a gold cross (given to Wagner, so he says, by Felix Mendelssohn) to induce him to switch religions. The desired event proceeds step by hilarious step to its conclusion, when Cosima and Lebe become not just partners but friends, Lutheran-at-heart-Catholic and Jew. 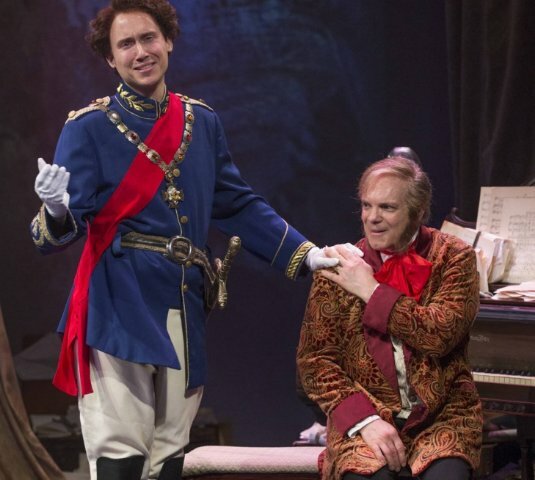 Wagner and company is a delicious evening of theater. Laughs may be the best way to face the charges of Anti-Semitism. 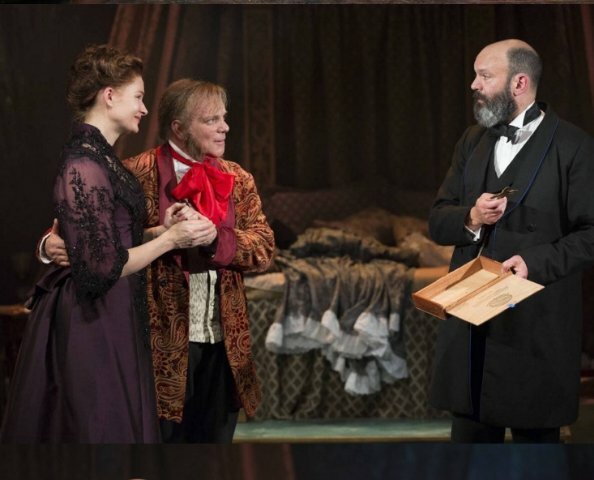 The playwright’s conclusion is humane and even probable. It is certainly a fun romp to heaven. "Thank you, Ms. Hall. I am flattered and encouraged."